There were five participants in our weekly dipper walk today. They were Bob, Eric, Jeff, Kathy and Tim. Shortly after the group gathered in Bluebird Park, there was plenty of action as the pair that were casually engaged in continuing to bring nesting material to the nest site were joined by a third bird (unbanded) whose presence precipitated some high-speed chasing. The interloper flew into the tunnel from upcreek at the same time that the female joined the male from the same direction. While the three were in the tunnel, the banded male extended his wings and flapped them in a manner that has been described as characteristic of dippers that are defending territory (and/or a mate) from an intruder. All three birds then took off upcreek (with the mated pair presumably chasing the stranger). Within a couple of minutes, all three birds returned, and shortly thereafter there was a chase downcreek. When we’ve witnessed similar encounters in the past, the interloper has apparently been driven completely out of the area occupied by the mated pair. That was not the case Friday, as the “stranger” remained not far downcreek from Main Street after the chasing ended. As we were leaving for the upper pond, the pair had returned to the nest area and the “stranger” was foraging nearby (just around the first bend downcreek). It should be said that we are presuming that the stranger has not broken the relationship between the pair that has been building the nest under main street. Because the female that has been with the banded male is not banded (and neither is the “stranger”) we have no way to know with absolute certainty which bird remained with the banded male after the chasing. The unbanded pair that have been seen together below the upper pond were found again foraging together between the spillway and bridge #1. Again, since these birds are unbanded, we are presuming they are the same birds. While we were watching them, they flew up towards the spillway and were later seen (and photographed by Eric and Tim) investigating a portion of the dam that is to the right of the spillway (as seen from below). One of the birds repeatedly went into an opening in the structure that may well be a prospective nest site. Eventually, both birds flew up to the top of the spillway and then to the pond. One of the birds was seen (and photographed) in an unusual pose. It pointed its bill straight out, stretched out its neck, and stayed in the position for several seconds (and did not DIP at any time while in that position). Eric’s photo clearly shows this unusual posture. Next dipper sighting was at bridge #3 where no birds were in sight when we arrived. Shortly thereafter, Mr. Green (the male) arrived with a pine needle in his beak. He landed on one of the rocks but didn’t fly to the nest and eventually dropped the needle. The unbanded female arrived a few minutes later, and eventually both birds took nesting material up to the nest. There were no further dipper sightings by the group. We went through Bluebird Park on the way to the cars, but no birds were seen. Jeff went to Hersey Street afterwards, and one dipper was seen flying upcreek and under Hersey Street. It landed very briefly on a rock in the creek just above Hersey but then disappeared upcreek. Jeff was unable to see if it was banded. Could this be the “stranger” that was seen earlier engaging the Main Street pair ? Could it also be the “third” bird seen the previous two weeks near the upper pond. 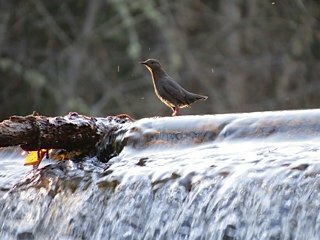 It’s certainly possible that Ashland Creek between Hersey and the top of Lithia Park has three mated pairs and one unmated bird that is roaming the area, looking for love in all the wrong places. Stay tuned. Four men wearing chest waders were seen by the group last Friday (March 8) walking up the creek in the water. Jeff recognized one as being Daniel Vandyke of ODFW. In conversation last Monday, Dan reported that he was with a group of volunteers who were surveying the creek for evidence of salmonid redds. Jeff told Dan about the dippers, and Dan said that he’d ask the volunteers to be aware of the nesting birds during any subsequent in-stream surveys.